I think we are all ready for the trip tomorrow. While I'm asleep, Mummy and Daddy are awake packing. For having to wake up at 5am tomorrow, Mummy has prepared sandwiches for our breakfast. My packing is done, it's lots of things to bring for me, there are especially many baby biscuits. That's in case we can't find baby friendly food in time. We have to bring Eyore along! Everyone's away, so how about Pillow? He's been 'deposited' at a pet's hotel, which is causing us lots of worries. It was Big jiu jiu and his girlfriend who brought Pillow there this afternoon, they feedback that the place was too horrible to look like a pet's hotel. Every dog seemed fierce, the place was overcrowded and that each dog looked sad being kept in their 'cell'. Pillow was so reluctant to keep walking when he reached there, he struggled to free himself from the leash and ran after Big Jiu Jiu when they were about to leave. The caretaker held him back. Mummy felt painful to know about it. He must have thought that we abandoned him. Silly boy.... bear with it, we'll be back to receive you. Let's be assured that he'll be well. 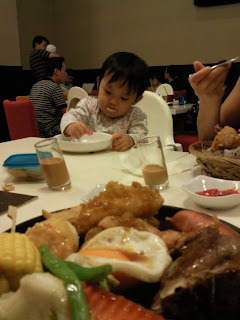 We were out for a dinner last Sunday evening, Granny invited us to join her church mates for dinner. There were some singing and clapping. Throughout the evening, I was entertaining myself or rather, I think I've entertained many people with my dance moves. I'm a rocker! I must have been very responsive when it comes to music and dance lessons in school. I'm a genuine music lover. Every morning, when Daddy tunes in to class 95 at home or in the car, I'll rock my body to whatever song it is playing. When I go shopping, I'll rock to the music in the retail shops. I'll usually invite stares, but then what is embarrassment to a little 14 month-er? Haha. I'm a cutie when it comes to body and music. Everyone in the family loves watching my self choreographed moves! Shoes are addiction to Mummy and it is what her daughter follows after. Look at my shoe collection! Goodness, I can hardly wear them in time before I outgrow. Moreover, I've only eyes set on one particular pair. Every outing, I would only fetch that pair of shoes to Mummy. Our shoes are large occupants of the shoe rack. Daddy is always nagging at Mummy, asking her to throw some shoes. Everytime Mummy buys a pair of shoes, Daddy would remind, "One in, One out." Well, who's cares, ladies are defiant when it comes to shoes - One is never enough! Now we know why girls seem more more expensive to raise than boys. A bold decision has been made recently – We’re going on a holiday to Taiwan next Thursday! Tickets bought and hotel booked. We’re talking about bringing a 14 month-er onboard an approximately 5 hours flight. Frankly, Mummy’s a little worried about the foreseen crankiness, the lack of baby friendly places and inappropriate food for me. We’re not bringing a cooker for my porridge of course. Grandparents, jiujius and their gfs are coming along too. Hopefully, they’ll be of much help with my entertainment. It’s a week away, but Mummy is already running my bring along items in her mind. She knows that my items are going to be the largest occupants in their luggage. Still, baggage space will not hold back her massive shopping plans. Well, fingers crossed, hoping I won’t fuss too much throughout the trip. I hope I’ll respond well to the hours of plane ride. I guess it’s lots of entertainment Mummy has to prepare – toys and snacks. It would be good if I can bundle it with a nap too. Dear God, please teach me to behave and let this be an easy, a safe and fruitful trip for all of us. Holidays are well deserved. 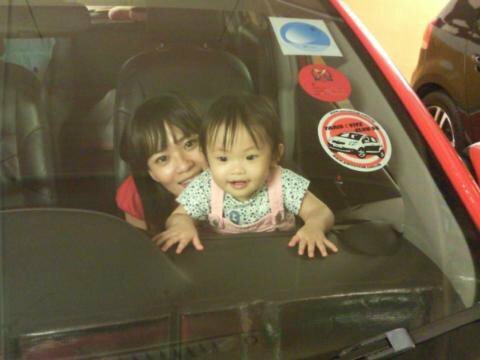 I want to Dad and Mum to enjoy too! 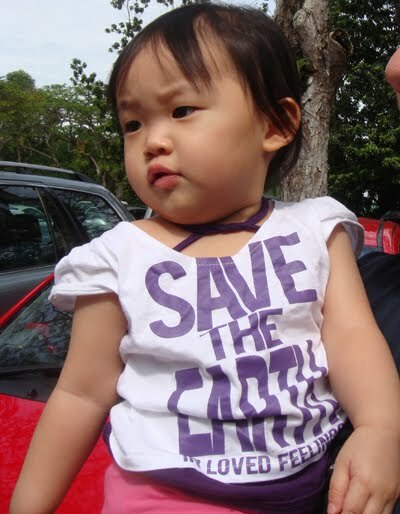 Yesterday was a beautiful hot Saturday, and my mission of the day was to 'Save the Earth'. This is how I began, made a trip to the Zoo, see and know all the animals. The wild, the tame, the danger and the endangered. My trip was awesome! If only the weather could be more perfect, but at least it didn't rain. That was thankful enough. 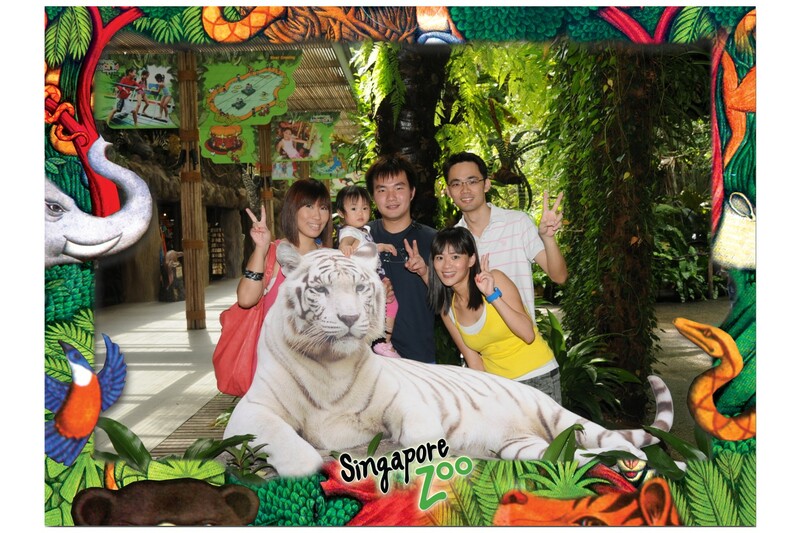 A part of the Zoo just for kids - Kidzworld. That is my world, a place where animals are tame and friendly. But next time if I go, I must remember my swim wear for a splashing time of fun. If only i brought my swim suit. Looks like fun!!! The sea lion kissed me, and that part of my hair stinked the whole day, even after a shower. The sea lion feeds on fish, so that explained the fishy kiss. So now you know why Daddy suggested to buy the photos? 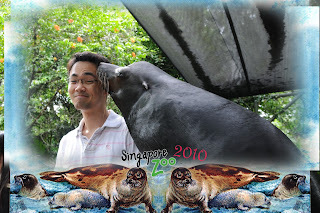 He looked cute when the sea lion gave him that fishy kiss! Zoo is really fun, not just for kiddos, but anyone! I was so entertained that I didn't fuss about the overdue nap, meal and diaper. 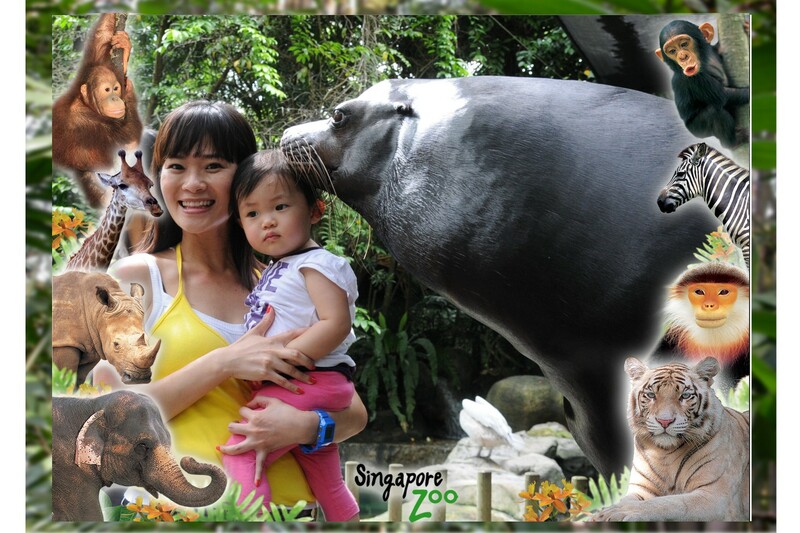 Now, Mummy's arms are aching bad from carrying me throughout the Zoo excursion. I was lazy, and didn't like to walk. Perhaps, I was afraid to be walking through, with the wildlife. Dear Zoo, I'll be back! Daddy trapped us in the car after groceries shopping yesterday. Help! Ok, just some candid moments. We were all tired from the long day of work and school, yet daddy could take out his camera phone, flashed us for a good 5 minutes before hopping onto the driver's seat. I'm eating at almost every interval. Daddy says that I never stop eating, and I take on Mummy's strong point when it comes to food, eating non-stop! If only weight is something un-worrying, Mummy would have gone even further for food. Mummy gets really amazed when she feeds me, she's in awe of how huge my tummy is. The portion of food she prepares for my meals always seem too much to fit into my tummy, yet amazingly, I could finish it. No wonder toddlers are usually seen with that huge little belly, making them look improportionately adorable. Haha. And what justifies a good meal is the massive amount of poo. That's a toddler's life - Eat, Sleep and Poo. Teachers are also updating my progress in writing to Mum and Dad. I had better behave, not sure what will be reported. Teacher said I'm so quiet during lessons, but isn't that suppose to be so? Maybe I need to try to participate actively in lessons. Alrighty, another 4 months to go before progressing to another class. Orchard Central is new mall, but it seemingly isn't as popular as the other malls around that vicinity. We've been there once, and didn't quite the place. Many blamed on the interior architecture. This evening, we were there to dine at the crystal jade uncle Evan and auntie PT recommended. Indeed, the place and food were great. After dinner, we walked around the upper levels of the mall, it wasn't too bad after all. There were many interesting food and restaurants yet to be discovered until today. OC is probably a place for food rather than for shop. Mummy's order... one whole chicken! Mummy loved this evening. She felt a special bond with me, not exactly sure how to describe it, but she felt happy! Perhaps I wasn't cranky and that I could behave in my high chair while Mummy finished her dinner. Behaving is the best gift to all parents. It's Mummy's 2nd celebration as a mother. On this day, I'm down with a fever. It happened on Mummy's birthday and it happened again on Mothers' day. I think fever has become my pressie to Mummy for these occassion. But no, just this year, for these 2 occassions, and no more! Alright, it was the school's teachers who made it so beautiful. I only contributed my little palm prints, but Mummy praised me for a job well done! I'm quite an arty farty little one... haha. I think I'm adorable with those expressive eyes... Haha. Packing my bag for an outing is like packing the whole house in. There are so many things to bring and remember on what goes into my bag. Mummy is always the packer of my bag, so when Mummy was in the office yesterday, she emailed Daddy a checklist of things to bring for our outing. She's not quite confident in Daddy when it comes to me. There are so many things to pack! And out of these, Mummy missed out a few items, forgetfulness is hitting both Mum and Dad. A checklist is so perfect for the forgetful.